A popular and much-loved fixture on the food festival calendar, The Exeter Food and Drink Festival is held in the scenic grounds of Exeter Castle Courtyard and Northernhay Gardens. By day, food is the sole focus of the event as the festival celebrates the food and drink of the South West. Those who love food will be in their element amongst more than 100 regional chefs, food producers, workshops and food-themed activities. A wander through the stalls and marquee will leave the senses tingling and there's much to be learnt on how to best prepare and cook local delicacies. Our own Dez Turland, Group Development Chef at Brend Hotels, has attended the event in the past. Then, by night, live music gives the festival a party feel - perfect for dancing off all that food. So whether you're swinging by or want to experience the whole weekend, we recommend taking the time to visit this mouth-watering event. Then it's back to The Park where your luxury accommodation awaits. 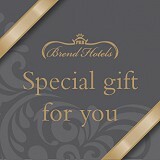 Park Hotel vouchers, our special gift for you. We currently hold four stars on Trip Advisor for The Park Hotel and Brend Hotels are holders of the accolade for AA Hotel Group of the Year 2015-16.